I also watch the program live on thei air, but play DVD's or captured programs off the air to enjoy a marathon. I don't play any shows online to support the writer's strike; writers are trying to get paid for their work that plays on the internet. David Letterman's production company, Worldwide Pants, signed a new contract with the striking WGA (Writer's Guild of America) because he negotiated with the writer's union separately. Hopefully other major production companies will also negotiate separately. WWP signed the contract that calls for exactly the same thing WGA leaders wanted to offer the studio Producers who refuse to talk with them. Back to The Office - this program, IMO, is spectacularly written and performed. The casting is perfect, and every performer scores a *10* each time he or she appears. Lead Steve Carell. playing boss Michael Scott, is a brilliant actor; Melora Hardin (along with her two outstanding, well-rounded, air-brushed co-stars) is spot on as his foil - playing his sometime squeeze Jan Levenson. 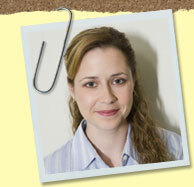 Jenna Fischer is a deceptively fine actor - I can see her star rising because of her excellent, nuanced performance here as receptionist Pam Beesly. The key to a long career for her is to do drama and comedy - and smart comedy at that. She can do it all - and should. 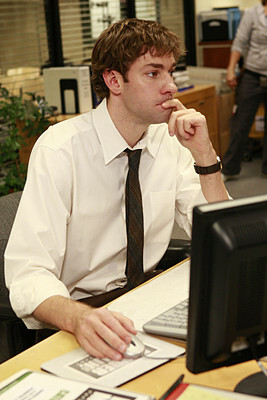 John Krasinski stars as affable Jim Halpert. Also a fine performer, he must be careful of being in low comedy duds like License to Wed. Just because a film features Robin Williams does not a quality project make. Much better to take roles that challenge him so he can show casting agents the full range of what he's capable of doing than doing roles he can simply call in. As I say, each actor on the show deserves an individual mention here - but space must be considered. But on the show, in fact, each performer's talent and skill are so impacting that each of them is isolated with a close up for their scenes, thanks to the "documentary camera" production technique established by the genius of Ricky Gervais and Stephen Merchant for the original BBC series. 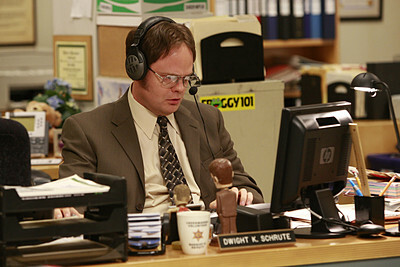 The Office was developed for American television by Greg Daniels. Daniels did a profound job; being an ardent fan of the original British series, I was not sure the show could be properly translated for American audiences. In fact, in its own way, the American series has turned out to be a cut above the original. As the sun sets, with several tasks accomplished along with sharing a day full of humor, social commentary and characters of The Office? I'm ready to do it all over again the next chance I get!